Reno, NV (November 10, 2016) – On the heels of Nevada’s decision to legalize recreational Cannabis use, Good Chemistry Nurseries is bringing its award-winning nursery system and world-class product to Nevada with the launch of a new Reno production facility that will service dispensaries throughout the state. The announcement was made today by company founder & CEO Matthew Huron. Good Chemistry Nurseries’ award-winning Cannabis will be located in dispensaries throughout the state of Nevada. Some of the company’s highly acclaimed strains include the legendary exclusive strains Ingrid and Mr. Good Chem, as well as their renowned Sour Diesel, Gorilla Glue #4, Amnesia Haze, XJ-13, OG’er, Durban Poison, Novacaine, Alien Dawg, LSD, Master Kush and Orange Bubblegum. Huron became involved in the medical marijuana industry when his father and his father’s partner were diagnosed with HIV/AIDS. In 1996, when medical marijuana became available in California, Huron saw firsthand the symptomatic relief patients experienced from this alternative medical treatment. In 2000, he began growing medical marijuana for AIDS patients throughout the state, founding and operating a nonprofit medical marijuana co-op that became one of the most respected and well-known facilities in San Francisco. After 10 years operating the Elmar Lins Compassion Co-Op, Huron moved to Colorado to co-found Wellspring Collective, which caters to seniors with health challenges and provides alternative health services. In 2010, he launched Good Chemistry Colorado, planning the facility infrastructure design and construction, acquiring the necessary financing and directing the resulting work. It is considered to be one of the finest vertically integrated cannabis companies in the state. Today, Good Chemistry employs a staff of more than 100, operating dispensaries in Denver and Aurora, as well as its new Nevada cultivation. Huron has developed and implemented best practices in the medical and retail marijuana industry, including a Compassion Care Program that enables patients with limited resources to obtain medical marijuana at little or no cost. His enforcement of policies and procedures throughout the company has ensured strict compliance with state and local regulations. Huron has collaborated with local leaders and law enforcement to enhance neighborhood safety and security. Since 2010, Good Chemistry Nurseries expanded cultivation operations in two large Colorado facilities that are devoted solely to the production of more than 60 strains of marijuana. In addition, they optimized the production of extracts and concentrates through solvent-less processing. Huron is a founding board member of the Cannabis Business Alliance (CBA) and a founder and former board member of the National Cannabis Industry Association (NCIA). He has served on the Colorado Department of Revenue’s Medical Marijuana Enforcement Division’s (MED) Licensing Authority Advisory Committee, which was charged with advising regulators on the development of production management, tax and other policies pertaining to the use of marijuana. Marijuana Business Daily estimates Nevada’s 2016 marijuana sales to be between $25 million and $35 million, up from $4-6 million in 2015. Nevada’s medical marijuana market is poised for tremendous growth. The patient base will likely continue to expand, while the ability for out-of-state patients to purchase medical marijuana from dispensaries could provide a huge boost to sales. Good Chemistry Nurseries will participate in the Marijuana Business Conference & Expo (Booth #1722) in Las Vegas from Nov. 15-18. For more information about Good Chemistry Nurseries Nevada operations, visit http://goodchem.org/nevada/. To schedule an interview with a Good Chemistry Nurseries representative, please contact Shawna McGregor at 917-971-7852 or shawna@rosengrouppr.com. About Good Chemistry Nurseries: Good Chemistry Nurseries is dedicated to cultivating the most consistent, high-quality cannabis available. 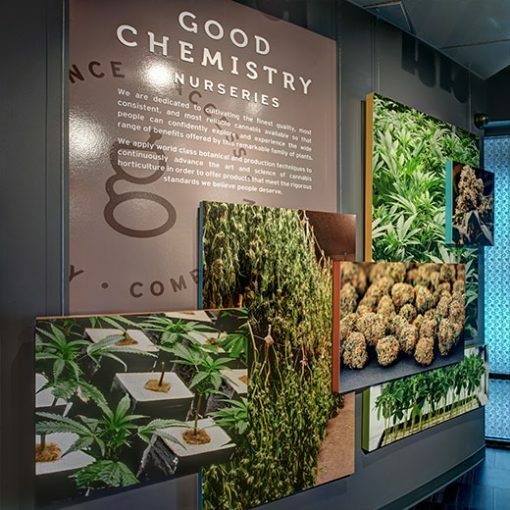 Good Chemistry’s dispensary locations in Denver and Aurora offer customers an award-winning lineup of medical and recreational marijuana products and outstanding service from our highly educated and passionate staff. Good Chemistry Nurseries has established one of the nation’s most sophisticated nursery programs, with grow operations in Colorado and now Nevada that produce world-class products at the highest levels of quality, reliability and consistency. For more information, visit www.goodchem.org. Follow us on Facebook, Twitter, Instagram, LinkedIn, Google+ and YouTube.